Sixty-five porters and 75 yaks labored over two years to bring more than eight tons of trash down from the slopes of Mount Everest – delivering some of it into the hands of local artists who are exhibiting their “upcycled” sculptures in a bid to raise awareness about the litter problem on the world’s highest peak. Expeditions in spring 2011 and 2012 collected rusty oxygen tanks, old cooking-gas containers, broken tent poles, discarded food packaging, and even part of a helicopter that crashed on the mountain in 1974. 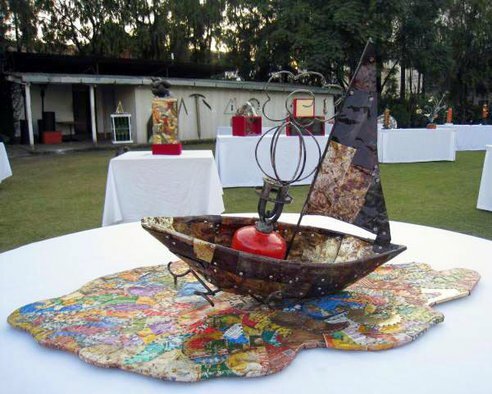 Some of the trash was donated to Da Mind Tree/Art Club Nepal, the host of a month-long visual art symposium during which 15 artists created 75 pieces from the recycled raw materials. Their works, including a wind chime made from old tent poles and an idol of the Hindu God Ganesh that incorporates the helicopter remains, are currently on display in Kathmandu. “We thought that this would help promote the artists as well as contribute to making Everest clean. We were happy to get the trash and [the waste collectors] were happy to get rid of it,” Kripa Rana Shahi, the organizer of the Mt. Everest-8848 Art Project I, told the British paper The Telegraph. The Art Club Nepal eventually hopes to raise enough funds to have the trash sculptures installed on permanent display in the Everest region – perhaps even along the trekking and mountaineering routes on which they were discarded – in order to make visitors and locals alike more conscious of the problem.